If you’re not from the Virgin Islands, you may be surprised to learn that there’s a growing vegan scene on the US Virgin Island of St Croix! Not that veganism is something new here. A lot of vegan food in St. Croix is Ital food, which comes from the teachings of Rastafarianism. Derived from the word “vital”, Ital food is meant to be natural and increase life energy. There is a variety of interpretations of what this means, but most interpret Ital food to be either pescatarian, vegetarian, or vegan. This is both for the reason that eating a dead animal (meat) goes against increasing life energy, and for the reason that eating a plant-based diet is more natural and healthy than eating a processed, meat-heavy one. So, with the exception of the Ital establishments, the restaurant scene in St Croix has been slow on the vegan food uptake. Don’t waltz into omnivorous restaurants expecting intentionally vegan options. But the great news is there are many vegan and vegetarian restaurants on St. Croix to frequent on your visit. Don’t leave the island without trying a fresh coconut! Being an island, most of the food is imported, so sometimes places run out of things. Even if a place has a large menu, don’t assume everything is available. Often, many places display the entirety of what they generally offer but only serve a plate or two and dessert of the day. Also, eating out might be more expensive than where you’re from (again, due to the need to import everything). Generally, the prices were on par with what we’re used to in New York, but if you’re coming from a less expensive place, the prices may be higher than you expected. Where to Find Vegan Food in St Croix? Officially there are two towns located on opposite sides of the island: Christiansted and Fredrikstad. In between, most of the island is rural or sprawl near the main roads. With one or two exceptions, your best options for vegan food in St Croix will be in these two towns. Also, keep in mind that Styrofoam and plastic are still heavily in use on the island (even for dining in), so we recommend bringing your reusable items with you to reduce waste when you eat out! Christiansted is the larger town of the two with lots of historical markers and old buildings dotting the streets. You owe it to the place to learn some local history and culture so make sure to visit the national historic site, Fort Christiansvaern. You can walk around and learn about the impact of the Dutch rule and slave trade on the island. Tucked away off the street and easily missed by a visitor sits this Ital vegan spot that also serves fish. They proudly proclaim to be gluten free, wheat free, egg free, and msg free. Every day they offer a different vegan plate of the day. They also have freshly made juices – again, make sure to ask what is available that day. We had the tofu pepper steak plate, which comes with seasoned rice, lentil balls, salad, and fried sweet plantains. Enjoy some real deal Ital food while basking in the amazing Rastafarian Last Supper mural that’s arguably much more accurate than Leonardo Di Vinci’s painting (most historians would agree that Jesus was not a white Italian guy). We’ve been told by locals that you can ask for the pretzel to be made vegan by not adding butter. All vegan deli (with locally sourced honey in some beverages). Everything is homemade so definitely come in to try a daily plate. You can call ahead to find out what’s on offer or just be surprised when you roll up. We had a daily plate with rasta chicken (breaded cauliflower), quinoa, rice with lentils, cornbread, black beans, and a side salad, and a lentil burger. The food tasted fresh, well seasoned, and delicious. As we sat down we bore witness to the regular stream of patrons coming in on their lunch breaks. When we were there in November 2018, the owner told us they were planning to transition into a more mobile situation. According to Happycow, they indeed made the move into a food truck in January 2019. This omnivorous spot with super vegan-friendly owner Chris is well loved and frequented by the vegan couple we house sat for. They generously treated us to a meal here before and after our month-long house sit on the island, so we can doubly vouch for this place! There are a couple of regular vegan items on the main menu, like a black bean burger and mediterranean plate, but often the daily specials feature even more vegan options. That’s how we all tried the Beyond Burger, fried plantains with mango salsa, and their ice cream. If you have yet to experience the Beyond Burger, the chef here really knows how to cook it. They also use a charcoal grill which gives the burger a fantastic smokey taste. Vegetarian Creation – mostly vegan with a couple of dairy items. Though it’s a bit farther outside the downtown, Vegetarian Creation is well worth the visit. We went for a Thanksgiving special, but a lot of this Holiday menu is also offered regularly in their daily specials. We couldn’t believe our eyes. Vegan thanksgiving on St Croix? Turns out it was more than we ever imagined. There was so much to choose from and we wanted to try it all. We’d have been very happy with even a third of the options. There was only choice to be made – try them all. The only thing we missed out on was their vegan lasagna made with cashew and pistachio cream. It’s a big seller and was sold out. While there are a few sit-down tables, we opted to take our feast home and assemble the spread. While they expertly prepared certain vegan products, like Tofurky, we were most impressed with their homemade offerings. Their red velvet cake was so good and we couldn’t begin to figure out how it’s so moist, spongy, and perfectly sweet. We suspect the secret is well kept by the moms and grandmoms we saw working in the kitchen. 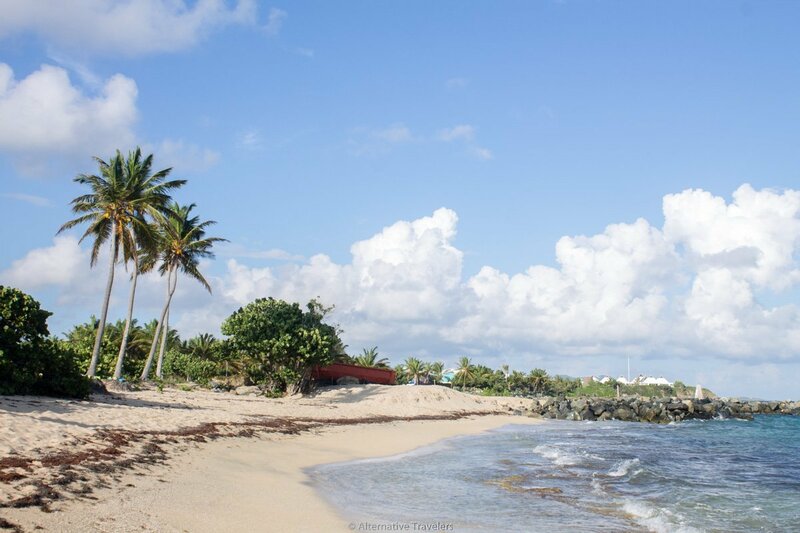 Frederiksted is the tourist hotbed as it is equipped with a cruise ship dock. It’s smaller in size than Christiansted but there’s more of a stark contrast between tourist street (along the water) and local streets (inland streets). Don’t miss the Caribbean Museum Center for The Arts, a free museum right along the waterfront. They also have a wonderful gift shop filled with local art. They’ll even ship it home to you so you don’t have to carry it around with you on your trip. But we know you’re here for the food, and it did not disappoint! Some of our favorite food on the island was in Frederiksted. Our favorite restaurants are the ones where seriously good, unique, and homemade food mesh with hospitality, care, and conversation. Owner Chef Kimba and Roots-N-Kulchah check all those boxes, making for a must-visit vegan restaurant on St. Croix. Unknowingly, on our first visit to Frederiksted, we had parked next to this restaurant (it was closed at the time). Upon returning we saw doors flung open, music playing, and a sign proclaiming a plate of a day – all homemade, all vegan. We couldn’t figure out how we missed it until we realized it had just opened for the day. This is a restaurant that’s designed to invite you in, stay awhile, and enjoy fine dining quality vegan food without the all-too-common pretension. The interior is all done by the owner, Chef Kimba, and it looks great. On our surprise first visit, we had just eaten, but that didn’t stop us from eating more. Fresh homemade ice cream was on the menu for dessert, along with fresh juices. The strawberry ice cream was fantastic – rich and creamy but with a fresh snap. And the soursop juice was tart, sweet, and refreshing. We were super impressed. After having a chat with Kimba we vowed to return to try his savory dishes. With a busy following week before we prepared to leave the island, we returned to Roots N’ Kulchah, where we were promptly chastised by Kimba, who (to paraphrase) had started to believe we wouldn’t return because we didn’t want his food. Truth is, we regret not knowing about the place earlier, or we would have come here several times. The sole proprietor Kimba is a trained vegan chef and it shows. The attention to detail and layering of flavors were exemplary of this level of training. Everything tasted incredible and we couldn’t even begin to figure out how he did it. This man could be a poster boy for veganism: super friendly, world traveled with lots of interesting stories to share, and you won’t believe his age (and you’d never guess). We had the pleasure of sharing conversation with him, learning a lot of the island life along with Kimba’s well-traveled history – he even used to live in Brooklyn! To think we could have crossed paths in our NYC days. There were two plates on special. The stuffed plantain was amazing and unlike anything we’d ever tried. I grew up eating plantains, but never like this! This stuffed plantain was perfectly cooked and soft enough to cut with a fork with a slightly caramelized outside. Then it was stuffed with a mock tuna salad made of chopped almonds and veggies in a creamy dressing. Our other dish was a tofu peppered steak on top of a banana fritter. The tofu was juicy and tender, seasoned similarly to the other Ital places we have been to. Though you can taste that this food is next level, thanks to his training as a raw chef in California. Roots-N-Kulchah is a can’t-miss spot for vegan food on St. Croix! This is a community space that sells homemade and delicious vegan Ital food. It’s for community first and foremost – be respectful to the space and people. This is not a restaurant nor tourist attraction, so keep your selfies to yourself. Expect some really good vegan food here. Everything is fresh and made in house. While there are varying size plates, your best bang for the buck is to split the Everything plate with a friend or take home leftovers for a meal later. The Everything plate is literal – the whole menu for the day will end up on your plate. Interestingly enough, upon receiving our plate I realized I had actually met the proprietors before. The day before, we were at the Cost-U-Less, a non-membership Costco-like bulk size supermarket. I spotted some seriously ripe bananas at a super discount, but nobody was going near them. As I ambled over, another gentlemen approached and watched me load several bunches into the shopping cart while he loaded up his own cart. “What do you to with them?” he asked. I told him that I love freezing them to make banana ice cream. Our house sitting hosts had a champion juicer which will turn whole frozen bananas into soft serve – literally. He said he loves to make banana fritters with his ripe banana haul. Turns out I was going to get to try those fritters, as we both exchanged a glance of recognition the next day at the Community Center. With our plate, he gave us one of those fritters to sample. Hot damn, they were delicious – super soft, chewier than a pancake, and oh-so banana-y. If they have banana fritters – you better get them. Also, don’t miss the super crunchy cookies. The first time we were there, we didn’t notice the cookies until we went to pay, and we didn’t have enough cash to get them that time. The woman next to us in line to pay gave us one of her stacks of cookies, telling us that we couldn’t leave the island without trying them. That’s just the kind of place this is – full of community and good vibes. Usually, where to stay is a concern for vegans and vegetarians. Breakfast included doesn’t mean anything when there’s nothing on offer you can eat! Great news! There are not one but TWO brand-new vegan hotels in St. Croix owned by the same team. Feather Leaf Inn is a absolutely beautiful, 10-acre oceanfront property that is entirely solar powered! It is part of a 200 year old Danish estate on the US National Register of Historic Places and there are ruins to explore throughout the property. The owners are in the process of planting a tropical fruit forest with a huge variety of mango, cashew, soursop, sugar apple, passionfruit, custard apple, guava, avocado, breadfruit and jackfruit trees, as well as over 100 coconut palms! Meander around the island with the provided bicycles, or stay close to the inn and swim in the ocean right in front. Having ocean access is super important as the ocean isn’t always easy to get to on St. Croix! Enjoy snorkeling, swimming, or sunbathing on the secluded beach without even having to get in a car. Book the Feather Leaf on Airbnb and Get $40 off your first Airbnb visit with our discount code: Click to get $40 off! Sugar Apple is so new it’s not even open yet at the time of publishing this post (March 2019). We’ll keep checking back and will update as soon as it is open for business, but for now we leave this here so you can plan for future trips. They also have events (like all you can eat brunch!) going before opening so check in with them before or during your visit. Sugar Apple is a 12 room bed and breakfast located in the heart of downtown Christiansted, just a couple of blocks from the waterfront. They serve vegan breakfasts by the salt water swimming pool (chlorine is so 2017). Dine in one of the Christiansted vegan restaurants at night, or make your own food in the kitchenette provided in each room. History lovers will be excited to know that some of the buildings date back to 1780! If you have at least 4 weeks on your hands and would like to do a work exchange, get in touch with the wonderful Terry and Michael of SunDog House. Take care of adorable dogs, cats, cook, and do a bit of light work around the solar-powered property in exchange for room and board. We actually house sat for these guys and loved the experience! We learned so much from them and we’re sure that you will too. Keep in mind that work exchanges are serious responsibilities and you live in someone else’s home. Work exchanges are not appropriate situations if you want to have a loungy vacation – see the accommodations above if that is your travel preference and style. That’s about it for traveling vegans in St. Croix! Stay tuned for our upcoming article on sustainable travel in the Caribbean to learn more about how you can minimize your impact when traveling to this part of the world. For now, check out our article 20 Sustainable Travel Tips for the Conscious Traveler! Any other recommendations for vegan food in St Croix?